Interested in inspiring others to try bicycling to work or to ride around the neighborhood with their families? Think your friends would ride more if they had just a little more confidence in their biking skills? Consider becoming an SVBC Education Volunteer! SVBC offers a variety of classes and workshops, for new and experienced bicyclists and community members primarily in Rockingham and Augusta Counties, and the cities and towns within. The classes and workshops we offer depend greatly on the volunteers who join us. Whether you only have an hour or two to spare every now and again or would like to help out regularly or even become a League Cycling Instructor, we can use your skills and energy to inspire others to have fun on their bikes. To receive information about upcoming volunteer opportunities Subscribe Here! 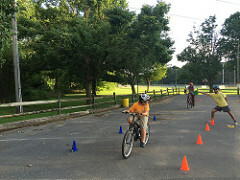 More about SVBC’s bike education efforts. Interested in becoming a certified League Cycling Instructor? Fall 2016 LCI Seminar coming to Harrisonburg. Get more information! Contact our local LCIs and we will be happy to help you through the process. [email protected]. Information from the League of American Bicyclists. Contact the SVBC Education Committee at [email protected].